LLes dealers de drogue ne sont pas toujours dans les rues ; parfois ils sont assis derrière des bureaux ou dans des salles de conférence, vendant leur marchandise dans des flacons pharmaceutiques au lieu de petits sachets de cellophane. As a writer, I'm constantly trying to improve, be it by taking online classes, doing tons of research, reading informative books and blog posts, or even buying a critiquing program to help me polish my work. But you know what? Sometimes you just gotta break the rules. I aspire to write deep third person POV, which means I'm doing all I can writing-wise to make a reader feel they are the character. And you know what? Lucky Lucklighter splits infinitives. He cusses a lot, and he ends sentences with prepositions. And not just in dialog. That's how he thinks, so that's what appears in the narrative. Yes, I take pains to form grammatically correct sentences to aid readability, but what if writing out the perfect sentence jerks the reader out of the story because my protagonist has just stepped out of character? So while my program points out that "ain't happening" is probably not going to get me an A+ on an English homework paper, as long as it helps readers be Lucky for 247 pages, I'll be happy. Yes, sometimes to tell the story that needs telling, you gotta break those rules. 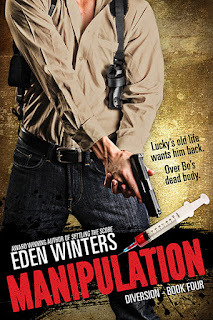 And speaking of Lucky (and Bo) and rule-breaking, I'm in the home stretch of Redemption (Diversion #5) and am setting a tentative pub date of August 1. Sorry for the delay folks, but I want it to be right. Also, the covers of the remainder of the series have been updated. 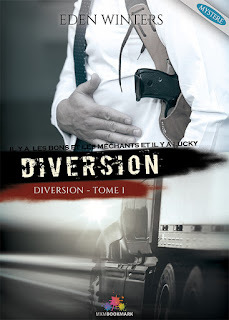 Collusion, Diversion Book 2, Second Edition, is now available for pre-order at Amazon. Look for it's release on Saturday, June 10. In celebration of Collusion 2nd edition, an ebook copy is up for grabs at Stumbling Over Chaos, my favorite site to hang out with kitties Chaos and Mayhem, snicker at the Misadventures in Stock Photography, and get my fill of Linkity. So hurry on over and get your name in the hat for the drawing. Say hi to May, Chaos and their Pet Mom Chris while you're there. Available from Rocky Ridge Books, June 20. 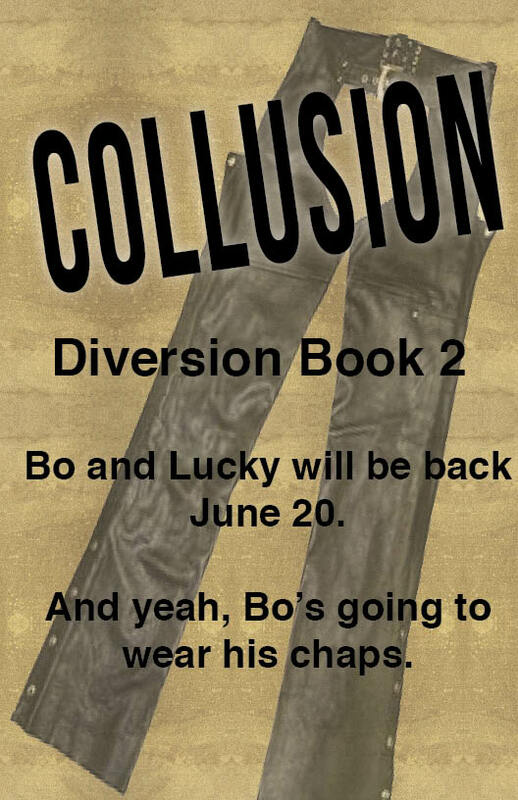 You may have noticed that Collusion, the second Diversion book, has been out of print, and on Goodreads has been sporting an ode to Bo's chaps instead of an actual cover (thanks, P.D. Singer!). Well, there's a reason for that. Yes, Collusion will be available again on June 20th from Rocky Ridge Books. Same story, brushed up with what I've learned since the original publication, and sporting a shiny new cover, courtesy of phenomenal artist L.C. Chase. But while I was at it, I had L.C. design covers for the rest of the series as well. "Why?" you ask. 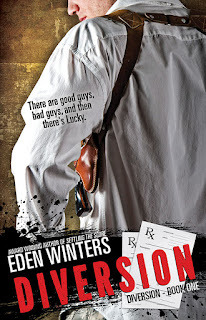 Well, while I love the original covers she created, and one even featured my good friend Clay, it's very hard to get a man who's 6'1" to look like 5'6" Lucky, although Clay makes a fantastic Lucky otherwise. Also, the model I chose for Bo from stock art has a limited number of photos available, and he's starting to show up everywhere. The solution? Frantic author hollers for artist and says, "What do you have in mind?" I trust L.C. a lot. And I'm sure you'll agree that she did an outstanding job, and her design is far more sustainable as I've planned at least four more books in this series. So, without further ado, here are the other covers in the series, which will appear on the books starting June 20, Collusion's release date.